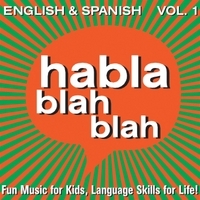 Fun music for kids / Language skills for life! VOLUME TWO now available! With all new vocabulary and two songs nominated by the Indie Music Channel 2016 for Best Children's Song and Best Children's Recording, enjoy! Same music on all three albums. Same lyrics, too, but sung in English, Spanish, and French - we dare you to keep from learning a new phrase! * Remember, start with the album in your mother tongue first, then switch to an album in the target language of your choice. JUMP named BEST CHILDREN'S SONG 2016 by the Indie Music Channel!! Available on CDBaby, iTunes, Amazon, Bandcamp and many of your favorite digital distributors. Double CD Packs with Two Languages: 18 songs per language with Lyrics Booklets Included in each.